Osmo Vanska will return to his old job as music director of the Minnesota Orchestra under a two-year agreement that will have him lead the group for at least 10 weeks each year. The contract, announced by the orchestra on Tuesday, also calls for him to take the same percentage pay cut as musicians agreed to earlier this year. "This is a great day for us to celebrate at the Minnesota Orchestra," said Board Chair Gordon Sprenger after the announcement. Vanska quit the orchestra in frustration last fall following a series of failed attempts by management and musicians to negotiate a new contract. His new agreement finalizes what many people see as the most important issue remaining from the acrimonious labor dispute between management and musicians. Sprenger has been leading negotiations with Vanska over the past few weeks. He praised the music director for raising the Minnesota Orchestra to international prominence during his tenure as music director. "So obviously, bringing him back and hopefully connecting with the musicians in the same way that he did before, we will rapidly come back to that same level that we were before the labor dispute." "Many of his responsibilities will be the same as when he was the music director before, but there are also some changes, some additions, some deletions in order to bring it to where we are today," Sprenger said. He emphasized that the two-year deal brings Vanska back as music director, not in the lesser role of principal conductor as was once floated. The run up to the 16-month lock-out began after the board proposed a contract in April 2012, cutting salaries by 35 percent, and changing hundreds of work rules. Board negotiators argued it would make the orchestra more financially sustainable, and give it more flexibility to deal with the challenges of the highly competitive world of live music. However the musicians disagreed, and after attempts at arbitration, the board locked the musicians out on Oct. 1, a day after the old contract had expired. That started a public relations war of nearly two years where musicians and passionate audience groups attacked the board for its lack of vision and heavy-handed concern with the bottom line. The lockout presented hardships for the musicians, as they were not receiving salary or health benefits from the Orchestra. Several took leaves of absence to work elsewhere, and there was concern many would not come back. The state Legislature even got involved after accusations that Minnesota Orchestra President Michael Henson had covered up concerns about the Orchestra's finances while asking for state bonding money to a renovation of Orchestra Hall and an expansion of the lobby. A report from the legislative auditor Jim Nobles later found no wrong-doing. After many false starts, including an attempt at peace-making by Middle East mediator George Mitchell, the two sides finally reached a settlement in January 2014. The musicians said the deal would mean about a 10 percent cut in salaries over the three years of the contract, but with changes in other benefits such as health care they say they took a 15 percent hit. The lockout officially ended Feb. 1 and the Orchestra returned to ecstatic audiences on Feb. 6. After the lockout ended, Vanska said Orchestra President Michael Henson would have to step down in order for the orchestra to heal. Orchestra management announced in February that Henson had resigned by mutual agreement. He will step down in August. "We have a large board and obviously board members have a lot of different opinions," Sprenger said. "But I would say at the end of the day today that they were all very much behind the decision that the board made and recognize that now is the time to move ahead and go on to new heights." At two years, Vanska's contract is shorter than the musicians' three-year deal. Sprenger said the length was mutually agreed upon between Vanska and the board. "That having two years would give him an opportunity to finish off his legacy that he started many years ago," he said. "And then at the end of those two years, what the future will bring who knows?" Reaction to the contract news was swift. "A great thing that is going to bring us back together with our board, and help bring us back with the community," said Doug Wright, who negotiated on behalf of the orchestra's musicians. "This chapter is finally coming to a close and I think a new kind of hard work is ahead of us where we truly begin the healing process within the organization, and we've got to reach out to our community and inspire them in a new and exciting way than we ever have before." Wright is also principal trombone for the orchestra. Like the other musicians, he has long argued Vanska is the best person to quickly rebuild an orchestra still reeling from a bitter labor dispute. "In my mind, I didn't see another choice and I think ultimately that the board obviously didn't either," he said. While there was tremendous bitterness during the lock-out Wright said audiences are now primed and excited by the orchestra's return. The co-chair of the audience advocacy group Save Our Symphony Minnesota, Jon Eisenberg, also said Vanska's return comes at just the right time. "We were very concerned about the damage and the loss of momentum. 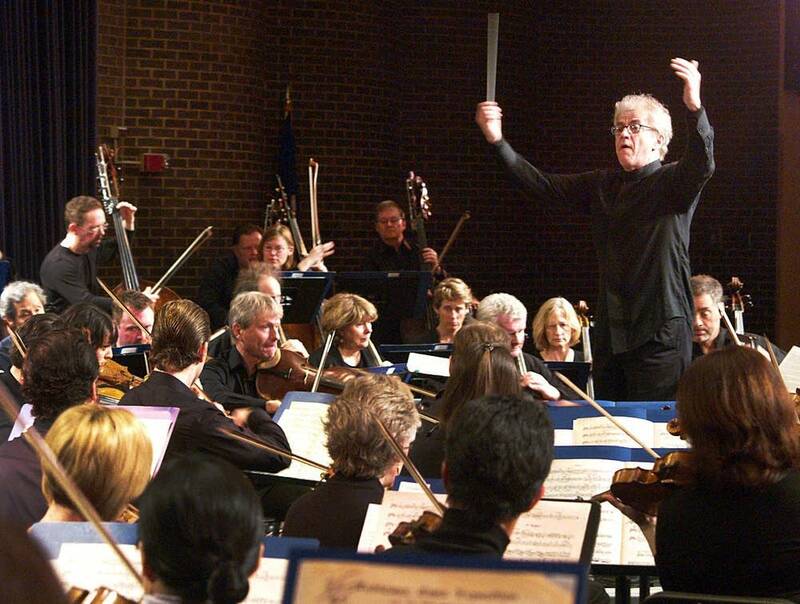 Right now the community is energized around the orchestra in a way it hasn't been in a long time," he said. "It's going to prove to be a historic decision and one that will be turning point for the history of this organization." Eisenberg, Wright and Sprenger agree there is still a lot of work to be done to restore the Minnesota Orchestra. All three are looking forward to Vanka's return for a gala concert on May 2 to mark the re-opening of Northrop Auditorium. Musician Doug Wright even issues a playful warning about how the audience will welcome Vanska. "I mean, bring your earplugs," he laughed. "And that's before we've made a sound!" Vanska is in Washington DC conducting the National Symphony Orchestra this weekend. In a statement he said he is "very pleased to have this chance to rebuild the Vanska/Minnesota Orchestra partnership, and I look forward to getting back to music-making with the players and together re-establishing our worldwide reputation for artistic excellence."